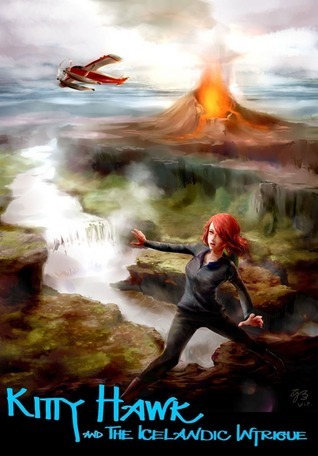 Following in the footsteps of her hero Amelia Earhart, Kitty Hawk sets off on an epic flight around the world and arrives in Iceland’s capital city of Reykjavik where she finds herself immersed in a beautiful alien world of volcanoes, Vikings, elves and trolls. Before she knows it Kitty is plunged head first into an amazing adventure that sweeps her across a rugged landscape where humans and nature exist side-by-side in an uneasy truce and magical realms seem to lie just out of sight beneath the surface. Kitty Hawk and the Icelandic Intrigue is the dazzling third installment of the Flying Detective Agency series featuring Kitty Hawk, and intrepid teenaged seaplane pilot with boundless curiosity and a knack for getting herself into-and out of-all kinds of precarious situations. This is a perfect book to fire the imaginations of readers of all ages-armchair explorers and amateur detectives alike. From dangerous criminals and corrupt government officials to mystical beings and clashes with the elemental forces of nature, this book has it all. Come and join Kitty Hawk as she experiences the strange and extraordinary world of the Icelanders, and unravels the Icelandic Intrigue. Iain Reading has done it again with another fantastic book in the Kitty Hawk series! This time we are thrown back into colder temperatures and more mystery than ever! From start to finish I wanted to know what was going to happen next and was constantly at the edge of my seat. I’ve said before in reviews for this series, but I honestly feel sometimes like Kitty Hawk is a real girl that I could end up bumping into one day somewhere around the world. She embodies so many great characteristics that make her seem so life-like and down to earth. I just love how she always gets herself into these crazy situations too and then manages to get herself out of them whilst still remaining humble and not terrified of basically everyone she meets! With each new spot Kitty Hawk travels to, it makes me want to jump on a plane right away and fly out to where she explored so I can see these places for myself. However, Iain Reading does an excellent job of giving each new location character and very descriptive so it almost feels as if you’re already there! As usual too the ending kept me wanting more so I’m so excited to start reading the next novel and don’t want this series to end! Where are we flying next and what will become of Kitty Hawk in the next book? I can’t wait to find out!